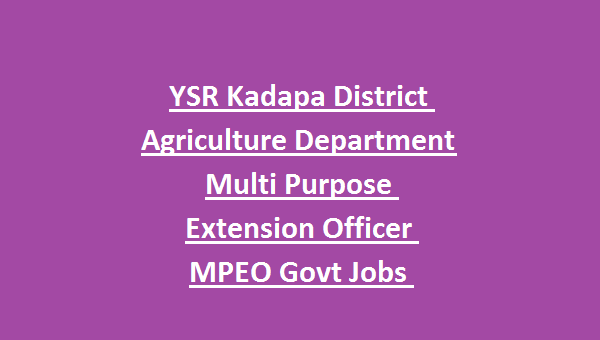 MPEO posts in this YSR Kadapa District Agriculture Department recruitment 2018. These MPEO vacancies are one year contract basis. Candidates selection will be based on 80% merit in qualification and 20% interview. Interested and eligibility criteria having candidates can submit their application to YSR Kadapa District Agriculture Department on or before 05-12-2018 along with all necessary documents. YSR Kadapa District Multi Purpose Extension Officer Jobs age limits, salary and other details are updated below. 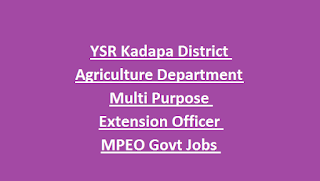 There are total 16 vacancies in this MPEO recruitment of YSR Kadapa District Agriculture Department Jobs. Category wise vacancies are updated below. As on 01-07-2018 candidates age limits are 18-40 years. For SC/ST/BC candidates 18-45 years. Rs.12000/- will be given for selected candidates. B.Sc (Agri/horticulture) or Agriculture/Horticulture Polytechnic Diploma or Degree in Botany qualification having candidates are eligible for this YSR Kadapa District MPEO jobs. Candidates selection will be based on Merit in qualification and interview. Last date for application form submission for this Kadapa MPEO jobs is 05-12-2018. Along with application candidates have to submit the Community Certificate, Nativity, Study Certificate, all educational certificates of Gazetted Officer before the closing date to the below given address.